Each summer some quarter-million people visit Boldt Castle and learn its tragic love story. Louise Boldt, forty-one years old and mother of two, died just as her husband was attaining great wealth and fame. In January of 1904 a telegram from George Boldt stopped work on their dream house. Despite millions of dollars spent, he abandoned the project forever. Contrary to this official version, generations of local folk have told "true stories" about what really happened. This largest book to study the Boldts and their fantastic building projects presents startling revelations that alter all versions of the tragedy. The author's "Search of the Lost Story" is recalled as a series of conversations about the Boldts and their projects. The informal dialogue presents decades of research and reports interview with family and others who have shared information, experiences, and personal impressions. 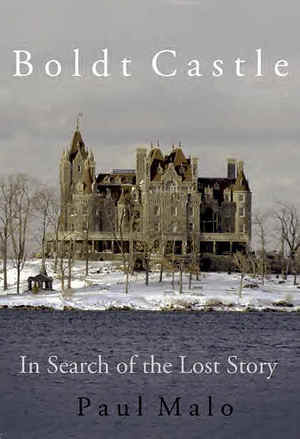 Boldt Castle and the other buildings of the Boldt estate are evaluated as historic architecture of national and international importance. Policy of current restoration is debated. A continuing campaign of renovation has cost nearly fifteen-million dollars already, making Boldt Castle one of America's premier historic landmarks.